Be the first to share your favorite memory, photo or story of Aesun. This memorial page is dedicated for family, friends and future generations to celebrate the life of their loved one. 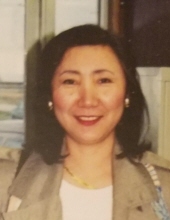 Aesun C. Mohler, 64, of Overland Park, KS passed away on March 13, 2019 at her home. Visitation will be held on March 17, 2019 from 6-8:00PM at Cedar Crest Memorial Chapel, 32665 Lexington Ave., De Soto, KS. Graveside service on March 18, 2019 at 10:00AM at Leavenworth National Cemetery, Leavenworth, KS. Aesun was born August 12, 1954 in Seoul, Korea to Pong and Kisik Chang. She married William D. Mohler on August 1, 1977 and for 17 years was a military wife. Following Bill's retirement, they moved to the Kansas City area. Aesun was employed by S&L of Lenexa, KS for 20 years. She proudly become an American, a mother, a military wife and a career professional. Aesun became a senior member of the Korean Presbyterian Church. She loved God, her family and America. Our Lord welcomed her with open arms. Survivors include: husband William of the home and son John both of Overland Park, KS; sister Oksun and Ron Wells of Las Vegas, NV and many nieces and nephews. To plant a tree in memory of Aesun C. Mohler, please visit our Tribute Store. "Email Address" would like to share the life celebration of Aesun C. Mohler. Click on the "link" to go to share a favorite memory or leave a condolence message for the family.